Last night, the Montgomery County Democratic Central Committee (MCDCC) accepted Chair Kevin Walling’s resignation. Vice Chair Arthur Edmunds will serve as Acting Chair until the members of the committee elect a new chair on on December 2nd. Bethesda Magazine’s Lou Peck has written about the controversy over the Montgomery County Democratic Central Committee’s (MCDCC) botched job on the Democratic sample ballot. Chair Kevin Walling, who works as a campaign professional, took direct control of the sample ballot and taken the brunt of the heat. See my previous posts on problems with the sample ballot here and here. 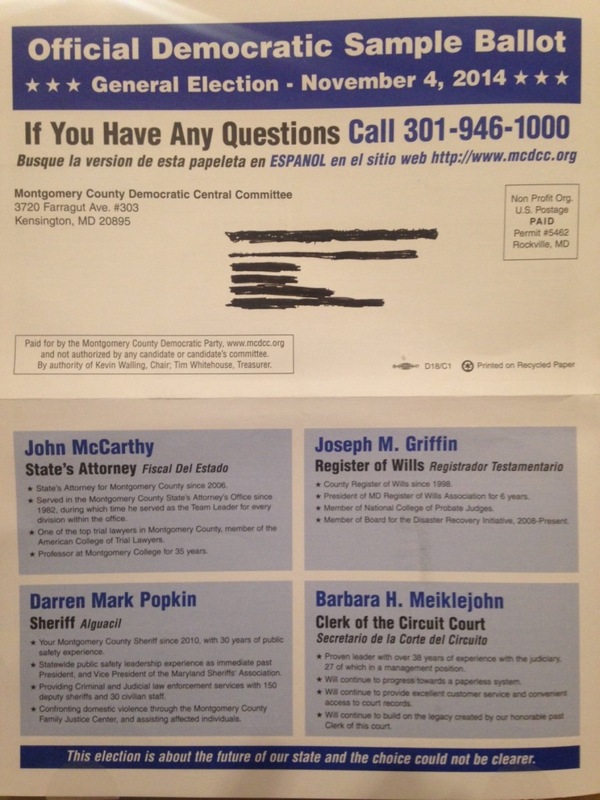 The Montgomery County Democratic Central Committee (MCDCC) sends out a sample ballot before the state elections to urge Democrats to the polls and remind them of their party’s ticket. There were some major snafus this year. I’ve been receiving a lot of reports, some conflicting, of problems, and have been attempting to sift out fact from fiction. This is why I’ve delayed posting on this topic. In District 19, incumbent Sen. Roger Manno‘s name has been replaced by that of Sen. Rich Madaleno–the candidate in District 18. As you can imagine, Sen. Manno–who donated money to help pay for the sample ballot–was understandably not happy about it. I suppose one could view this as karma, since Rich Madaleno’s name appeared as Roger Madaleno on the Apple Ballot during the Democratic primary. But at least the critical last name and first initial were right in that case. I hope Roger gets his donation back. In District 16, Delegate Nominee Marc Korman‘s biography has been replaced with that of Aruna Miller. I am sure Marc was interested to learn that he worked for county since he was eight and has already served on a House committee before winning election. MCDCC has touted its efforts to reach out more strongly to the County’s fast-growing Latino community. Unfortunately, the sample ballot was a textbook example of how not to go about it. Finally, the sample ballot directs people on how to find a Spanish sample ballot online. Other than that it doesn’t exist, this is an excellent idea. Small Mailing and Still Waiting? Beyond the giant mistake in District 19, the real story may be how many sample ballots were sent out. I am told that elected Democrats were promised that hundreds of thousands would go out but that only around 90,000 were mailed. I am unable to confirm this. MCDCC has made clear that they will not respond to my requests for information, though I understand they are also being closed-mouthed with electeds on this issue too. While many, including your gentle blogger, have received their Democratic sample ballot, I have heard that other Democrats who did not vote early have yet to receive them. No doubt this is due to the last minute mailing. On the other hand, I imagine Roger (or is it Rich?) Manno must be relieved that at least early voters did not get it before going to the polls. There were no signs for either Brown/Ulman or for Brian Frosh. In other words, there were no signs for the two statewide candidates who need strong visible support in Montgomery on Tuesday. Some told me that they were shocked that their congressman was left off the sample ballot. This is not an error but intentional in order to comply with federal campaign finance law. Advertising their names counts as a campaign contribution. 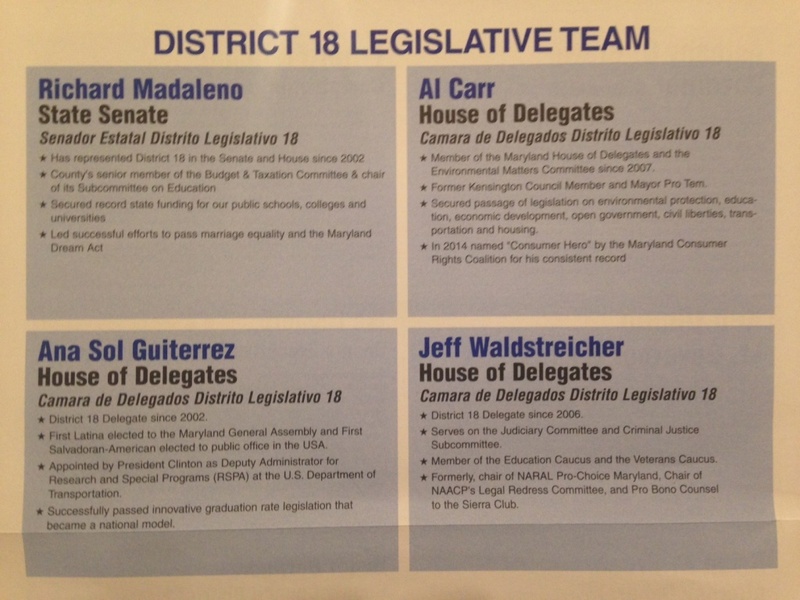 MCDCC Chair Kevin Walling personally managed the sample ballot with his inner circle (the Politburo? the Presidium?) of MCDCC. It arrived very late to the printers and few others were involved to review it and make sure that they got this complex task (different versions need to go to different areas of the County) right. MCDCC staff has long been dedicated to the Democratic Party and helped with this task many times before. They should not be blamed and I hope no one tries to throw them under the bus in order to save their own reputation. As in the past, MCDCC has many excellent members. But they need to address these issues squarely. The central problems with MCDCC remain the ones I outlined in a previous post: a lack of accountability, transparency, and inclusion. I should now add incompetence. Mistakes happen but both elected officials and ordinary Democrats are mad about the sample ballot snafu–and rightly so. Despite recent posts highlighting shortfalls of the new Montgomery County Democratic Central Committee (see here and here), the new MCDCC has a lot of potential. MCDCC has a lot of energetic new members as well as ongoing members with valuable experience. The MCDCC meeting last night revealed some additional strengths. New Chair Kevin Walling did a fine job of running the meeting. He made sure that people were heard even as he worked to make sure that the Committee moved through an ambitious agenda. In general, despite a diverse range of approaches, MCDCC members seem willing to listen and to learn from each other. Many brought good ideas to the table. And even if there were some bad ones, they at least deserved a respectful hearing. There are gaps on two fronts, however, that need to be addressed if this potential is to be realized. Just as a willingness to try out new ideas is important, the Committee needs to collect information on an ongoing basis that will allow MCDCC members to assess their effectiveness. At the MCDCC meeting, reports lack this critical information. For example, the report on the precinct organization said that more people were joining than were leaving or dying. But there was no information about the number of vacant slots or how many vacancies were filled or created. Other reports similarly referred to success but provided no hard data on accomplishment. The fundraising committee did not report. Even the budgetary information provided to MCDCC members was highly limited with no basic breakdown on the sources of funds. And that was not provided in advance of the meeting. Trying new fundraising techniques is great but this sort of information is vital to assess whether they should be repeated. Additionally, since resources are limited, assessment needs to occur not just as to whether a positive outcome occurred but if this was the smartest, best use of resources. In short, members seem very supportive of one another but need to learn how to build a team even as they make dispassionately these sorts of judgements on the value of various activities. Not everything is going to be a success. So what? It’s often worth trying new ideas and you can still thank the people for running with them. But declaring everything a success won’t help move the Committee forward. Chair Kevin Walling alluded to this need to make judgements when MCDCC discussed the issue of whether it should mail the Montgomery Democrat newsletter to all members. The costs versus the benefits–as well as alternative benefits that could be accrued by spending the money otherwise–should be examined. Following through on these sorts of tough discussions is exactly what needs to happen. MCDCC needs to become more open not just with Democrats and the media but with each other. Currently, information is increasingly kept within the Executive Committee and not even shared with the broader Committee. This trend seemed to accelerate after my post critical of their fundraising efforts with a flurry of proposals (that fortunately seem to have died down) on how to gag other members even though the subject of the post was discussed at a public meeting and robocalls were made around the County. So MCDCC needs to be more willing to consult openly with each other not to mention rank-and-file precinct workers–especially on proposals mooted to change the precinct organization–and even pesky bloggers like me. Hunkering down into an ever shrinking circle is the exact opposite of the inclusive approach advocated strongly by all members of the Committee. I think MCDCC can do it. No doubt there is a steep learning curve, especially just before a general election. And people who have new ideas also need to listen to members who have more experience. But only with more accountability and transparency will the exciting ideas to move the Democratic Party in Montgomery forward and prove Will Rogers (“I don’t belong to any organized political party. I’m a Democrat.) wrong really have a chance to succeed. The Montgomery County Democratic Central Committee (MCDCC) held training for Democratic precinct officials this past Saturday and several sources report was controversy over access by precinct officials to MDVAN–the Maryland Democratic Party’s voter database. MDVAN allows users precinct officials to select out different groups (e.g. new voters, Spanish-speaking voters, inconsistent voters) of voters for get-out-the-vote (GOTV) purposes. It also allows the creation of walk lists so that canvassers can conduct their work efficiently. In the past, precinct officials have been given access to the database but only for their one precinct. When asked about goals for the training by MCDCC Precinct Coordinator Melissa Pinnick, many responded that they would like to learn how to do more with MDVAN. Eventually, MCDCC Chair Kevin Walling explained that precinct officials would no longer be given access to MDVAN and made clear that this was state party’s decision. Instead of MDVAN, precinct officials were told that they would be given a PDF with lists of voters from their precincts. Precinct officials were not happy–many have worked their precinct for the Dems for a very long time–and asked who they should contact to do something about it. Maryland Democratic Party Compliance Director Meredith Bowman explained to me that access to MDVAN is completely at the discretion of county party chairs. I also did not get the impression that the state party was aware of the issue in Montgomery County or that they had demanded the change. In response to my query about why he decided to deny precinct officials access to MDVAN and other questions, Kevin Walling communicated via email that he had to consult the MCDCC Executive Committee. While there may well be another side to this story, I don’t know his or MCDCC’s viewpoint. Rep. Van Hollen spoke to the precinct officials on Saturday and gave a good rousing speech that communicated the value he and other elected officials place in the precinct organization for getting out the vote for the party year in and year out. Apparently, the MDVAN issue would not go away and he was asked publicly about it by a precinct official. Once the issue was explained to him, Rep. Van Hollen said immediately that this is exactly the sort of thing that drives him crazy and that he would see what he could do about it. By Monday, MCDCC was saying that precinct officials who want access to MDVAN can have it. MCDCC confirmed this at its official meeting on Tuesday. The Montgomery County Democratic Central Committee (MCDCC) recently made over 70,000 robocalls asking for volunteers and money. Only 400 people pressed a button to respond positively to new MCDCC Chair Kevin Walling’s plea to support state and local candidates. So far, multiple sources report that they do not know if a single dollar has actually been raised by follow-up calls to the estimated 0.57% who responded positively to this recorded message. Regardless, it looks like that MCDCC will be lucky if they don’t lose money. The calls came as a surprise to much of the Central Committee, which did not, at least as a whole, approve or learn about them in advance. I have heard the calls described as misleading because they give the impression that the money donated is directly going to support local and state Democratic candidates. I imagine that MCDCC leaders would argue that monies raised will support their efforts to aid Democratic candidates. Except that it looks as if any money raised will have to be plowed back into paying for the solicitation. The poor response is why most dialing for dollars occurs with a live voice on the phone. This fizzling fundraising effort follows on a similarly unsuccessful direct mail campaign. MCDCC included return envelopes in the solicitation, which sounds like a good idea. But it also made the mailing more expensive and did not result in a higher return rate than previous efforts with only small amounts raised. So far, Kevin’s early efforts to increase fundraising by MCDCC–one of his core promises in seeking the chair–have yet to bear fruit. And expanding the broader donor base has to be even more difficult outside the height of election season. The Montgomery County Democratic Central Committee (MCDCC) has undergone major change since the 2010 Democratic primary in the wake of discontent by government employee unions–SEIU, FOP and the Firefighters–coordinated with the Montgomery County Young Democrats (MCYD), as detailed in a series of earlier posts. How can we measure the success of MCDCC in the future? New MCDCC Chair Kevin Walling has promised a “comprehensive finance plan.” Of course, the proof is not in the planning but in the dollars raised. I look forward to comparing the financial success of MCDCC next year compared to past years. Similarly, promises have been made to revamp the precinct organization and make it more inclusive. Next year, MCDCC should compare both the number of vacancies then and now as well as the diversity of the precinct organization. MCDCC Chair Kevin Walling also campaigned for the position with the ambitious promise of developing a “strong field plan” beyond the precinct organization. He has three months before this year’s general election to organize–not a lot of time but this will be a great test of how nimble the new MCDCC is. MCDCC should measure how many field hours it organizes beyond those contributed by precinct officials this year and 2016. One of the trickiest areas that MCDCC faces is taking positions on issues. Many new members have expressed interest in MCDCC going beyond the already controversial ballot measures endorsement process to take positions on other issues as a means of motivating greater participation and out of a belief that the party organization should lead. Questions: On what issues will MDCCC take positions? Will it develop a formal process or just do it on the fly? How will it deal with the conflict between elected officials and outside supporters? Last time, the precinct officials solidly supported the position of the officials on the sample ballot. Will the Central Committee overrule the views of the broader organization? In a secret ballot earlier tonight, Kevin Walling defeated Alan Banov by 14-10 and was elected chair of MCDCC. Two members of the central committee were absent and voted by proxy. None of the other offices were contested. However, I received an interesting call from one of these people who explained that several of these people are supporting Alan Banov or remaining neutral in advance of tonight’s expected contest for the top spot. While Kevin is asking people to vote for these candidates as well as himself, they did not know about it in advance or necessarily agree to back him. Tonight, the Montgomery County Democratic Central Committee (MCDCC) will elect a new chair. Incumbent Chair Gabe Albornoz did not run for reelection, so the office is vacant. One very promising candidate, Almina Khorikawala, narrowly lost reelection, so the contest is shaping up a bit differently than expected. Two candidates are currently actively seeking to become chair. Kevin Walling was planning to run for the top spot even before Almina did not win reelection (or he had won election to MCDCC). Originally, Kevin launched a campaign for delegate in District 16 but switched to the central committee race. The organizers of the Unity slate dumped another candidate for one of the at-large seats to make room for him. Kevin will be serving his first term on the MCDCC. In the primary, he came in seventh with 28,695 votes compared to 42,619 for leader Marjorie Goldman and 25,585 for Dave Kunes who came in ninth and missed the last seat. Kevin is positioned as the candidate of the younger and newer members who were added to the Unity slate after MCGEO and Montgomery County Young Democrats threatened to run and to finance a challenging slate. MCGEO had little success in the election but the restructured MCDCC remains a bright spot. New members have expressed interest in taking more positions on policy issues, as well as re-energizing the party more generally. However, it was MCDCC’s stand on ballot issues that caused labor unhappiness, so it will be interesting to see how that works out and elected officials feel about it. Alan Banov, an incumbent fourth-term MCDCC member from District 18, also plans to seek election as Chair. Alan currently serves as chair of MCDCC’s Issues Committee. Alan will inevitably be cast as the voice of experience who knows more about the operations of MCDCC. Alan first ran for election to MCDCC in 2002 and won one of the at-large seats. He won reelection in 2006 and 2010. In 2014, the organizers of the Unity slate slotted him for one of District 18’s two seats and he won without opposition. Other candidates could well emerge in this election that resembles the process for filling vacancies in the General Assembly, though it is unclear to me whether candidates need a plurality or a majority to win election. Vacancies require a majority with the bottom candidate eliminated until someone receives a majority. If only a plurality is required, Banov or Walling could win with a plurality if other candidates emerge or some members abstain from the vote. Members will also need to act strategically if more than two candidates emerge–as could well happen in this very much behind-the-scenes contest.